As we’ve discussed here many, many times, restaurant wait staff often rely on tips because their base pay is generally far below the minimum wage level. Since tipping is an anomaly overseas, waiters in most other countries are paid a living wage. Thus, one sushi restaurant in Manhattan, which claims it has always paid its employees well, has recently started telling customers that tips will not be accepted. Sutton talked to the restaurant’s owner who says he decided to not go the route of some restaurants who simply add 18-20% service charges on to bills rather than have customer tip. That’s really just the same as the old system; it just saves the diner the hassle of doing basic math. 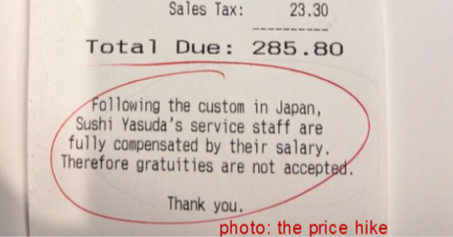 Instead, Yasada’s owner raised the menu prices a bit and simply tells customers: Do Not Tip Your Waiter. “We just take tipping out of the equation,” he explains to Sutton. He claims that paying your staff a solid wage that doesn’t fluctuate from day-to-day based on tips is a good way to build stability among your workers. In spite of this being the standard for most of the world, there are only a very small number of restaurants in the U.S. that don’t accept tips and also don’t tack on service fees.